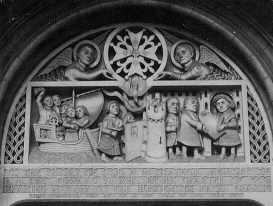 Who were the Huguenots? The origin of the word is obscure, but it was the name given in the 16th century to the Protestants in France, particularly by their enemies. The impact of the Protestant Reformation was felt throughout Europe in the early 16th Century. Its greatest protagonists were the German Martin Luther and the Frenchman Jean Calvin. In France Calvinism penetrated all ranks of society, especially those of the literate craftsmen in the towns and of the nobility. 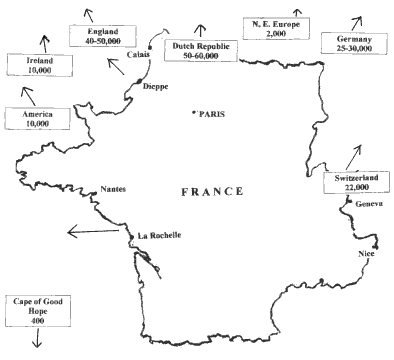 There were eight civil wars in France between 1562 and 1598 - the Wars of Religion. Protestant church to be set up in England. Descended from this church is the one in Soho Square, London. In 1589 the Protestant Henri de Bourbon, King of Navarre, inherited the French throne after the deaths of his three Valois cousins, sons of Catherine de Médicis. Civil war continued, so in 1593, in the spirit of 'Paris is worth a Mass', Henri converted to Catholicism. Five years later the civil wars ended and Henri issued the Edict of Nantes which gave the Huguenots, his former co-religionists and comrades in arms, considerable privileges, including widespread religious liberty. Over time Huguenots became loyal subjects of the French crown. However, their position became increasingly insecure as King Louis XIV, grandson of Henri IV, listened more and more to those who advised him that the existence of this sizeable religious minority was a threat to the absolute authority of the monarch. Gradually the Huguenots' privileges were eroded. In the 1680s Protestants in certain parts of France were deliberately terrorised by the billeting of unruly troops in their homes ['the Dragonnades']. Finally, in 1685 Louis revoked the Edict of Nantes, while exiling all Protestant pastors and at the same time forbidding the laity to leave France. To the considerable surprise of the government many did leave, often at great risk to themselves. Men who were caught, if not executed, were sent as galley slaves to the French fleet in the Mediterranean. Women were imprisoned and their children sent to convents. About 200,000 Huguenots left France, settling in non-Catholic Europe - the Netherlands, Germany, especially Prussia, Switzerland, Scandinavia, and even as far as Russia where Huguenot craftsmen could find customers at the court of the Czars. The Dutch East India Company sent a few hundred to the Cape to develop the vineyards in southern Africa. About 50,000 came to England, perhaps about 10,000 moving on to Ireland. So there are many inhabitants of these islands who have Huguenot blood in their veins, whether or not they still bear one of the hundreds of French names of those who took refuge here - thus bringing the word 'refugee' into the English language. Because of the political climate of the time, in a Britain strongly suspicious of the aims of Louis XIV's France, and in fact about to begin a series of wars to curb those ambitions, the Huguenots were on the whole welcomed here. This map indicates the main routes used by Huguenot refugees, the countries to which they went and the numbers settling in each area. However, as the pamphlet literature of the time shows, they could not entirely escape the accusations levelled at immigrants from time immemorial -that their presence threatened jobs, standards of housing, public order, morality and hygiene and even that they ate strange foods! For at least half a century the Huguenots remained a recognisable minority, making their presence felt in banking, commerce, industry, the book trade, the arts and the army, on the stage and in teaching. Although many retained their Calvinist organisation and worship - treated more generously by government than home-grown nonconformity - by about 1760 they had ceased to stand out as foreign, even following the path of Anglican conformity in religion which some had taken from the very beginning.